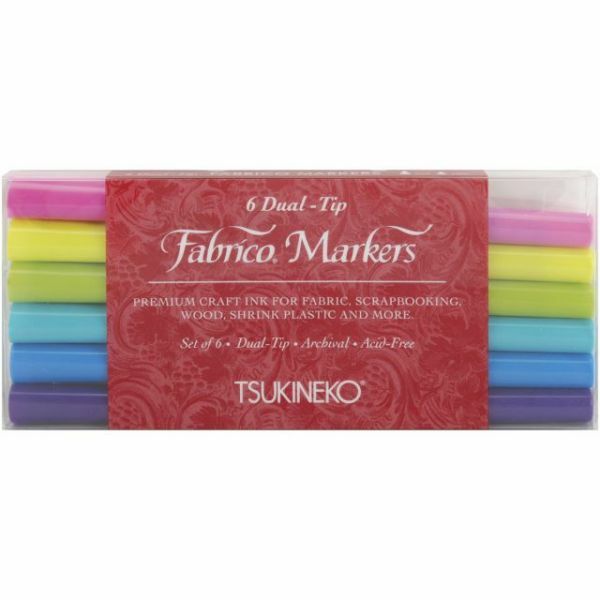 Fabrico Dual-Tip Markers 6/Pkg - TSUKINEKO-Fabrico Dual-Tip Multi-Purpose Marker Set. The markers feature both a brush and a bullet-tip specifically designed for smooth ink flow. Excellent for adding details and lettering to stamped projects on a variety of surfaces: paper, fabric, wood, shrink plastic and more! Acid-free and fade-resistant premium craft ink does not need to be heat set. This package contains six markers in assorted colors. Available in a variety of designs (each sold separately).Conforms to ASTM D 4236 and F963. Imported.